Yesterday we got the move I had been expecting although the surprise that I hinted at in the write-up came faster than even I anticipated. But my ‘gut’ had kept me, and hopefully all of you, from holding any longs. From yesterday’s write-up: “….yet I’m getting to the point in this market where even intra-day longs don’t feel right as opposed to the previous days. 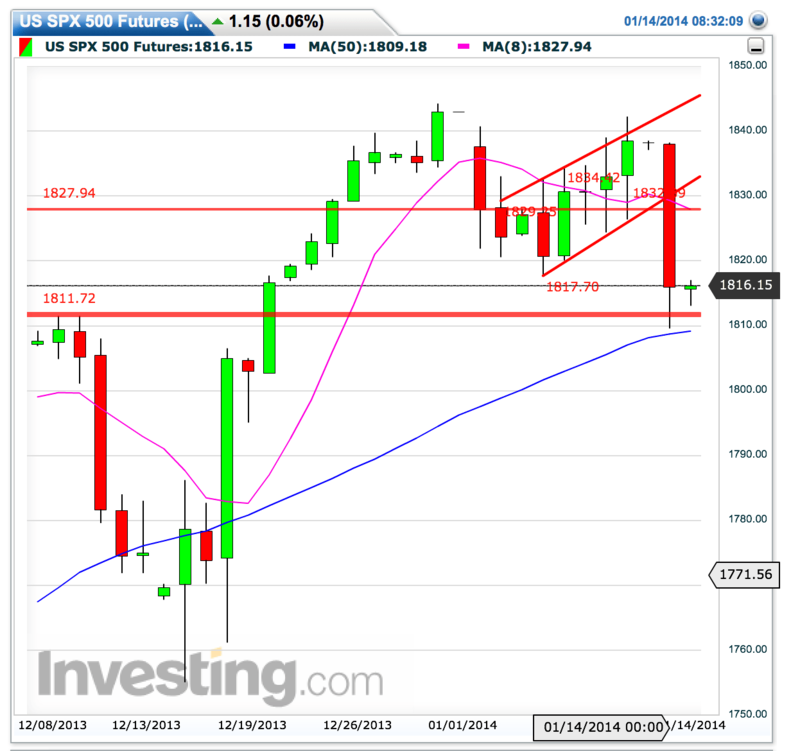 Bottom line we got the bear flag break and the move into $ES 1810-1814 I had been talking about. So now what? Before I get to this I want to do a little plus/delta on the trading day and talk about how I manage a day like this as it’s clear from the questions I got that some of you were struggling a bit. Days like yesterday can be stressful, but they don’t have to be! First off: Days like yesterday are HARD! They move fast, they are largely unpredictable and they mess with your emotions, especially if you are caught in the wrong direction. But even if you have the direction right the most common mistakes that people make is that they want to catch every move, overtrade, chase, panic, overexpose themselves and end up turning a winning day into a losing day and then get frustrated. I’ve made all these mistakes in the past and most traders do at one point or another. So what I want to do is walk you through what I did yesterday, what worked for me and what didn’t and hopefully this will help you in your future trading as it shows you how I strategically and tactically approach a volatile day like this. And keep in mind that hindsight is 20/20, but view it in the context of what happened. Remember: The goal is not to maximize every turn and twist, but to grow the size of your trading account. Market open: Markets were biased up again and started pushing into resistance. $IWM in particular caught my interest as it was nearing all time highs. The $VIX was immediately dying hard and $GOOG was strong as a raging bull. Yet I was keenly aware of the bear flag pattern and the fact that markets had drifted upward for 5 days in a row without much conviction. I also knew that Mondays tend to be weakest as of late. With this in mind it seemed highly improbably that markets would just scream to new market highs. Hence I layered into short positions: First with $IWM and then with $GOOG. I was prepared to to scale in higher if need be. Yet markets did their initial turn lower. I highlighted the key area of $183 $SPY and as we bounced on break I took profits on the shorts. Now in hindsight clearly I could’ve held longer and made more money on the shorts. Or scaled out and let the winning position run. Clearly a strategy I could’ve pursued. But keep in mind I was already heavily short the market via $VIX futures. So I knew if a break occurred I would gather further profits and if it didn’t break I had profits locked in. Typically I do not talk about how much money I make on trades and rather focus on entries and exits but I will today in rough terms to illustrate in more detail the concept of sizing & risk management and how it impacts decision making and how important a trading plan is. Nobody knew how the day would unfold yesterday. While my targets turned out to be right on the money as we ultimately reached the 1810 area I could not have told you that this market would hit it yesterday. So here’s how my P&L unfolded: Out of the open my $VIX futures were moving down $4K. I was ok with that as I had set up as a swing trade and that $VIX was approaching its lower target area. When I entered the $IWM and $GOOG puts I knew I could take a further hit as I was prepared to scale in further. Yet when the market turned the following happened: My $VIX futures P/L turned flat and my put positions turned into a $4K profit. It is at this level I took the profit on the puts. So I was locked into the gain. I was puzzled that the $SPY was down $1.5 and yet $VIX futures were still hovering around the same level they were on Friday. That made little sense, so it gave the false impression we might bounce here. I decided to stick with $VIX as a swing trade nevertheless and locked in the gain on the puts. So now $SPY started approaching its gap and it was at this point I started scaling into $SPY calls as the move was straight down which usually doesn’t happen. RISK MANAGEMENT: I had just banked $4K in profit. I will not risk this entire profit, so my first scale into $SPY calls was $500 (first I got stopped out for 7 cent loss) I then reestablished and then my 2nd scale in was $1,500 for a $2K risk total, but based on profit I had guaranteed myself $2K profit on the day. So I’m not risking turning a profitable day into a negative day! At this point my $VIX futures started turning into nice profit as well and rather aggressively, as we moved lower and as I scaled into my 2nd $SPY call position I scaled out of $VIX completely for a $5K profit for $9K total profit on the day. Why no longer swing? Because the odds of a reversal was increasing as we now had filled the gap and were approaching my original targets that I had identified. I was now sitting on $9K profit with a $2K long exposure. So I had a stake in the upside with a guaranteed $7K profit. This is how you create a stress free environment on a day like yesterday. I’m now in a position where I don’t really care if the calls go to $0. Of course I prefer to see them become winners, but it doesn’t hurt me if they don’t. Now as the $ES started hitting my original target buy zone below 1814 I started scaling into $ES long positions. Why? Because now we are hitting oversold into support and I feel more comfortable to put larger capital to work. So scaled in for an average of 1812.25. Overnight we drifted higher into the 1817 area. Guess what? After a +5 move I had banked enough profit on the $ES contracts that they now paid for the $SPY calls. So I decided to take the profit. I’m now sitting at $9K profit with $2K worth of $SPY calls in essence for free. As I do expect a bounce I’m also cognizant that we may re-test the lows or go even lower. Now that I’m back in mostly cash with calls in play I can be pretty relaxed about it. If we gap up and race toward resistance I can bank the calls. 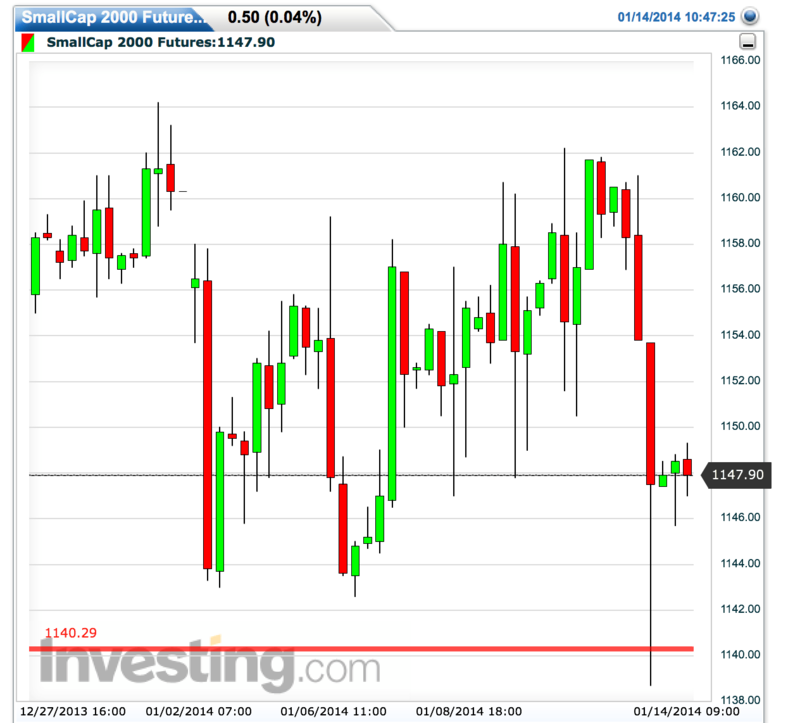 If we head lower I can re-enter futures at a double bottom test or next support level. Remember Wednesday is large POMO, earnings are coming, we have Fed speakers and it is OPEX, so there is bias for some upside this week still. My monthly $ES target in the 1780 area is still very much in play and I’m looking to reshort on any sizable bounce. 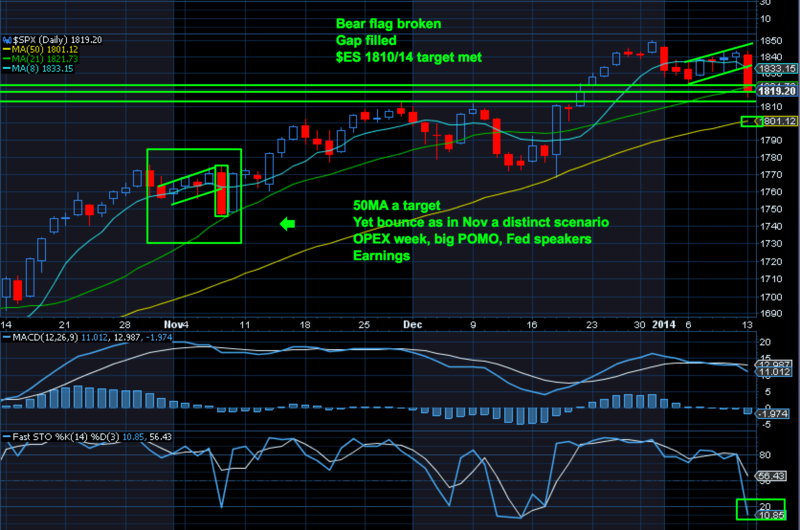 The most logical target for a bounce is the 8 MA and bottom of the bear flag re-test, so 1828-1833 area. This is where I would consider rescaling in short. Specifically today I’m interested in getting long the $RUT futures. As you can see it acted the strongest on the bounce last night. A re-test of lows would make it an interesting long from an R/R perspective with a stop a bit below yesterdays low. I will focus on index trading and any individual stock trades I may take will be earnings lottery related and I’ll post these ideas throughout the day in the feed.